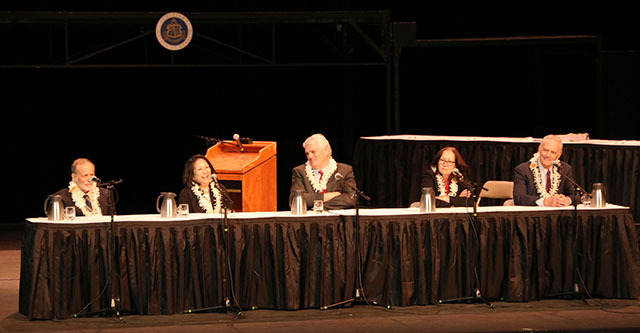 The Hawaii Supreme Court Justices enjoy a light moment as they answer questions from students at Castle High School. 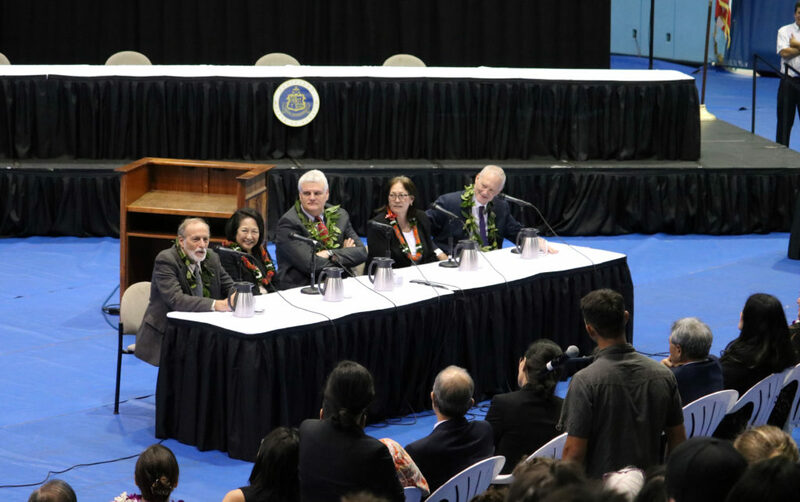 From left, Associate Justice Richard W. Pollack, Associate Justice Paula A. Nakayama, Chief Justice Mark E. Recktenwald, Associate Justice Sabrina S. McKenna, and Associate Justice Michael D. Wilson. Courtesy photo. 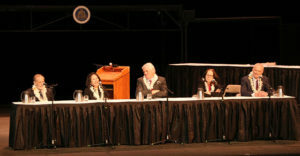 The Hawai‘i Supreme Court will hear an oral argument at Kealakehe High School Gymnasium in Kailua-Kona in the case of State v. Kaneaiakala as part of the Judiciary’s Courts in the Community outreach program, providing students an opportunity to learn more about the Judiciary’s role in government and its function in resolving disputes in a democratic society. 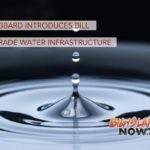 To prepare, the participating junior and senior students from Hawai‘i Island schools study a curriculum developed by the King Kamehameha V Judiciary History Center and the Students for Public Outreach and Civic Education of the University of Hawai‘i’s William S. Richardson School of Law. 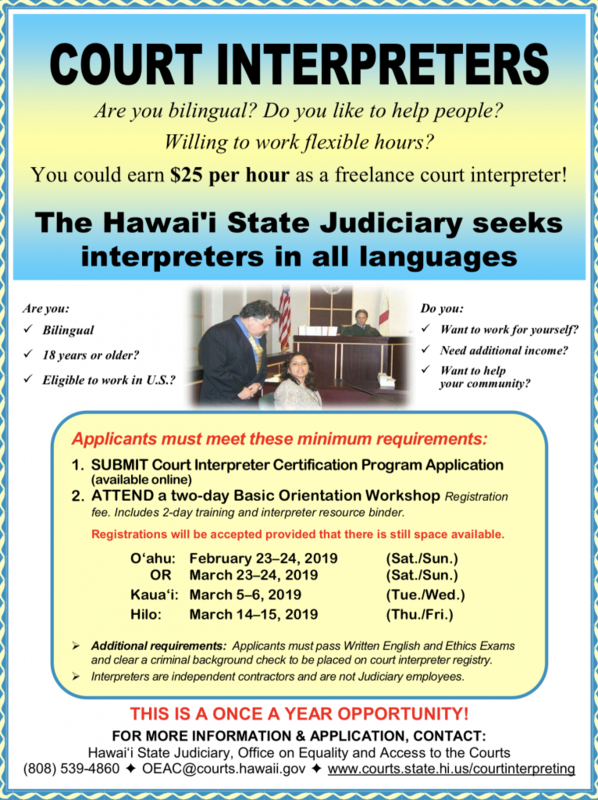 The students’ study culminates with a moot court activity facilitated by members of the West Hawai‘i Bar Association in which the students argue the pending case themselves. Photographing or filming the faces of the students in the audience will not be allowed. A few students will be available for on-camera interviews following the event. Oral argument will be followed by two separate question-and-answer sessions for the students; one with the attorneys and another with the five justices. The question-and-answer sessions will not be open to the media or the public, for the privacy of the students. Donna V. Payesko will emcee the event and Judge Robert D.S. Kim will be the moderator. 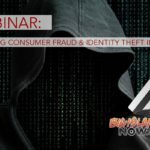 The event will be on Thursday, April 26, 2018, from 10 to 11 a.m. and the doors will open to the public at 9:30 a.m.
Kealakehe High School Gymnasium is located at 74-5000 Puohulihuli St. in Kailua-Kona.